Daytime talk offers brands something no other TV production really can provide - true integrated conversation points about a brand, in 'brand speak'. Messaging is more able to be controlled. Implied celebrity endorsement is achieved. And a comprehensive program with on air, retail and digital elements can be activated. But the trick is... to make sure it is not overtly brand heavy, and that’s something that productions take very seriously. No talk show series never wants the viewer to feel like they’re watching an hour long commercial, which is why securing a brand partnership with is that much more special… and at times, even difficult - such as in this case study partnership we're going to share with you. In this blog post, Hollywood Branded provides a look into a product placement integration talk show case study and paper goods brand , and how it raised awareness about the brand's major extension into new retail locations. Although the show’s name has changed a couple of times with the shifting of hosts, ABC’s daily talk show, Live with Kelly and Ryan (its current namesake) is an absolute institution in television history. Given its steadfast popularity, it’s no surprise that this is one of those properties that brands kill to be a part. This partnership came about when we were approached by our great agency friends over at Empower to work together on a partnership. Their client, White Cloud, a leading manufacturer of toilet tissue and paper towels, was building up marketing efforts to support the end of their retail exclusivity deal. They were going from being available in one store, to being available in seven, and they wanted shoppers seeing their brand on these new shelves for the first time to have that brand recognition. Deciding on Live with Kelly and Ryan (though at the time of our discussions, Ryan had not been officially announced), was a choice we came to after some serious research. Of course, with it being toilet paper and paper towels, this is a product that every viewer of every single show needs. So, after approaching and presenting to the brand about four different viable options, given the content, steady viewership, and general contractual stipulations, we settled on a September – October 2017 Live with Kelly and Ryan campaign! The actual logistics and creative of the campaign came together fairly quickly. Both the show and the brand loved the idea of giving deserving viewers style makeovers so once that was agreed upon, the rest of assets fell into place, albeit some more gracefully than others. Both the challenging and great thing about working with a well-oiled machine like LIVE is that they’ve done their fair share of brand partnerships and know the process like the back of their hand. The benefit of that is of course, that many of those things set in stone exposure traditions, made it very easy, organized, and turnkey. However, the challenge is that some of these ironclad exposures really didn’t fit the brand so getting the show to tailor them to White Cloud’s needs took longer conversations. One of those set-in stone things that we loved from the show was their use of Host Mentions, Contest Promotions, and Branded Vignettes. These were line items worked into the contract. What the heck are they, you ask? Let us quickly walk you through! Host Mentions were, you guessed it (! ), call outs from the host where they shouted out the brand name and reminded viewers to enter the contest for a chance to win a makeover. These shout outs were accompanied by previously shot B-roll of the different varieties of toilet paper on display in the studio. This was done intentionally so that every time the viewer heard Kelly or Ryan say the White Cloud name, they also saw the product. These were done two times over the course of six-week long campaign. Production sent us over the script in advance, so White Cloud knew exactly what was coming their way! Fun fact* Our team was on set when they shot this B-roll, and as you would assume, the packages of toilet paper were sent in advance so that production could get the beauty shot. They did this directly after a show taping, and during that taping Kelly joked to the audience during a commercial break that this toilet paper had more security than her! In all seriousness, one might not think that being present for shooting 5-seconds of product B-roll is necessary. However, as a brand representative, we were able to catch at least two instances where the packaging was a little crumbled or cut off from view by another package. It’s things like that that a cameraman doesn’t quite have an eye for like a dedicated brand rep! Here's what that product b-roll ended up looking like. Contest Promos were 20-second animated videos reminding viewers to enter the contest. They ran five times throughout the six-week long campaign, directly before a commercial break. The great thing about the promos is that in addition to driving to the branded microsite (more about that below), they included a verbal mention of the brand, a messaging point, the brand’s logo, and two different packaging shots. Again, because of the beauty of the show’s well-oiled machine, production sent us the animation in advance, so White Cloud could see it beforehand, make tweaks, and provide final approval before it went live. These promos ran around once a week throughout the six-week long partnership. Week six was the big reveal of the ladies’ makeovers. After five weeks of build-up, each day of the sixth week was a different reveal followed by the Branded Vignettes. The Branded Vignettes were 20-second animated videos similar in style to the Contest Promos, however, they were solely dedicated to brand mentions. They included three messaging points, three different packaging shots, and the White Cloud logo present throughout. 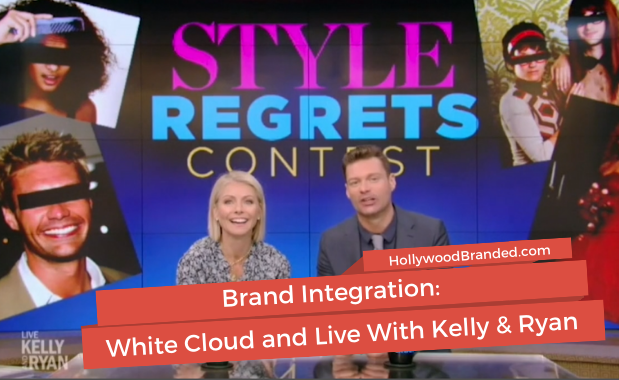 Part of this integration partnership was a LIVE/White Cloud co-branded microsite that lived on LiveWithKellyandRyan.com. From LIVE’s main website, there was a large White Cloud-Style Regrets logo that would lead you to the microsite. It was here and only here that viewers could enter to win a makeover. In additional to going here to enter, we made sure that this microsite was a source for everything White Cloud. It was here that viewers could find a White Cloud coupon, a detailed product shot of White Cloud’s most popular products, link to White Cloud’s homepage, link to follow White Cloud on Facebook, videos of the previous LIVE/White Cloud mentions, and of course links on where one could buy White Cloud product. 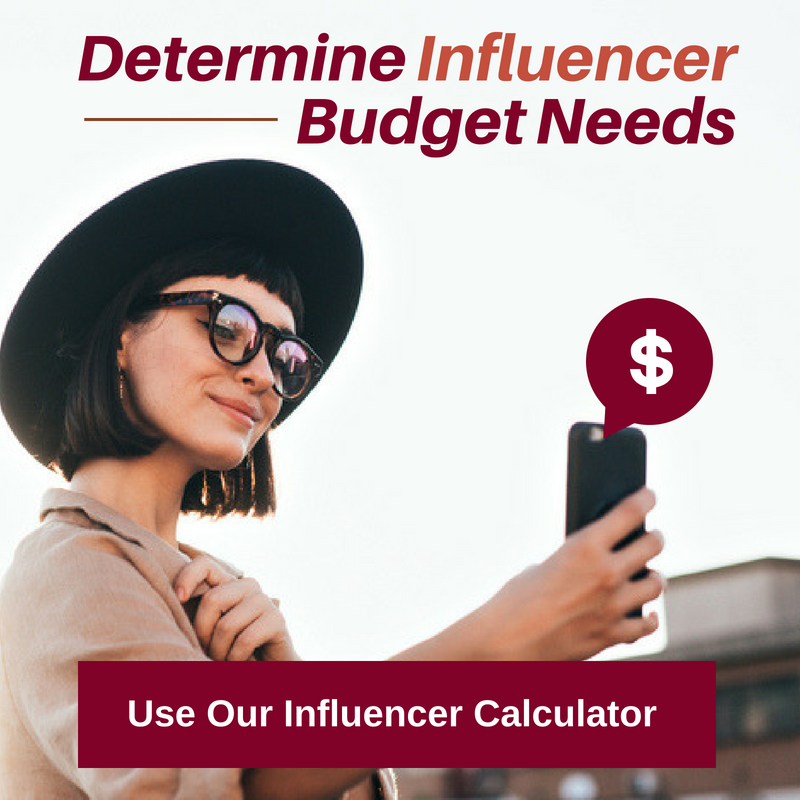 So, with each of the above on-air mentions driving viewers to the microsite, not only did they have the chance to win a makeover, but they also were highly educated on the White Cloud brand and easily directed on where they could purchase (with a coupon of course!). Here's a quick preview of White Cloud's microsite in LivewithKellyandRyan.com. As we’ll go into in more detail later in this blog, it was extremely important that this partnership extended itself outside of just LIVE. Part of that was securing the rights to use LIVE assets on White Cloud’s homepage. So during the length of the campaign, whenever someone visited White Cloud’s website, they were greeted with a digital banner of Kelly and Ryan, linking it to the microsite where White Cloud fans could enter the contest as well! This header ran on White Cloud's website throughout the campaign. Continuing with this theme of giving the partnership legs outside of just what you’re watching on television, we made sure that White Cloud would receive three social media call out from the Emmy-award winning show. With two on Facebook, and one on Instagram, the three posts were videos of the host announcements, and in they all included a tag of White Cloud, driving traffic to their social accounts, which thanks to extended TV show rights, were also flooded with LIVE/Style Regrets Content! We’ve all been hearing it – content, content, content. We’re in age where, simply put, people want to see interesting stuff on the social accounts they follow. 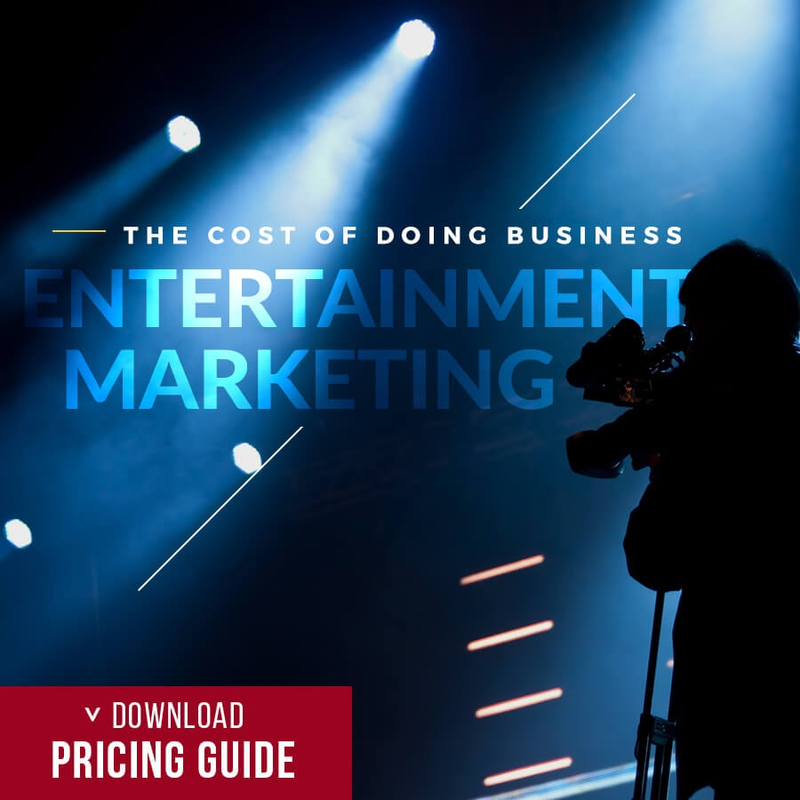 For a brand, coming up with cool content that’s applicable to your product can be difficult, which is why it was extremely important for us to have access to much of the LIVE content for White Cloud to re-purpose. And boy did they! Of course, all images and verbiage needed to be approved by the LIVE team, but once we got that approval, White Cloud was able to fill up their Twitter, Facebook, and Instagram with fun LIVE/Style Regrets content! After some good old-fashioned negotiations, we were able to secure LIVE title and host image rights for White Cloud to use on their marketing assets through the run of the show partnership. Aside from the on-air content, I’d argue that this was the most important component to the partnership. 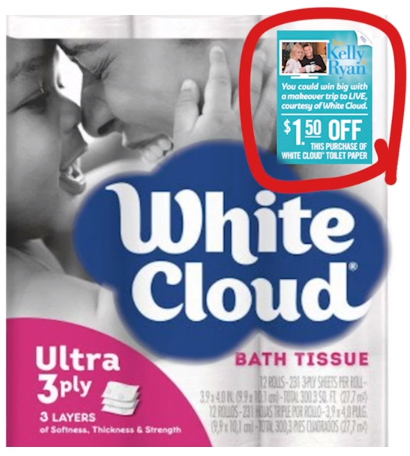 White Cloud used Live with Kelly & Ryan images on a coupon sticker that lived on certain packaging, in coupon booklets, on digital banner ads that ran on retailer websites, circular ads, and on newspaper FSI’s. As many shoppers were seeing this brand for the first time, seeing the product with faces that you see in your living room everyday made the product cool and exciting! Shoppers were intrigued by the new option as opposed to passing over it in favor for their usual brand. This addition to the campaign reached MILLIONS, with the newspaper FSI reaching 30 million people alone and the digital banners providing direct marketing to shoppers at multiple retail partners. Here's a co-branded coupon that lived on a White Cloud's products throughout the campaign. Another big was the release of not just one, but two press releases from the LIVE team. These press releases went out to promote both the announcement and reveal of the Style Regrets Campaign. They included insight to the partnership, and a boiler plate on White Cloud as a brand. It was a great additional touch of branding that gave White Cloud a leg up. Of course! In fact so much so, that the campaign hadn’t even finished before we were working on a contract for another campaign just weeks away. The partnership was mentioned in an Ad Age article discussing the brand’s revival into the retail masses. 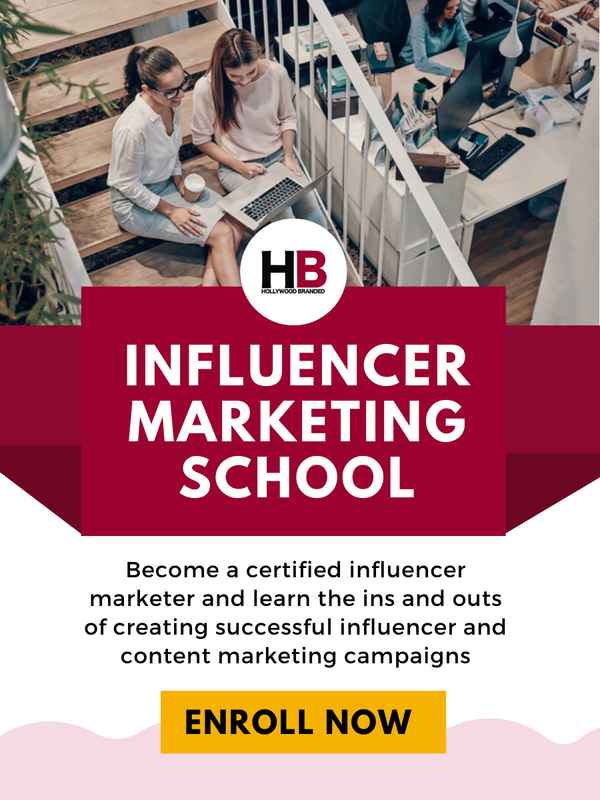 Throughout the campaign, the brand received 12 on-air mentions in front of 4 million daily viewers, three social posts out to an audience of over 5 million, and co-promotional retail marketing assets that hit over 100 million people. Overall the campaign reached 117.6 million people, and made shoppers kiss Cottonelle goodbye, and wave White Cloud hello! Want to see for yourself? Check out the recap of the partnership below! 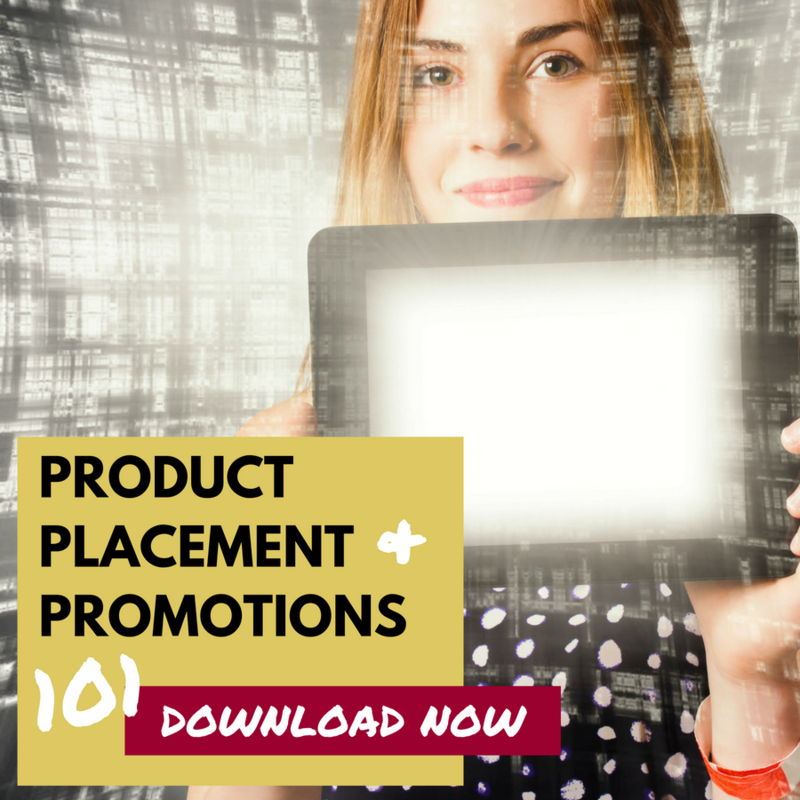 Here are a few other blog posts we've written on placement integrations. Check them out! 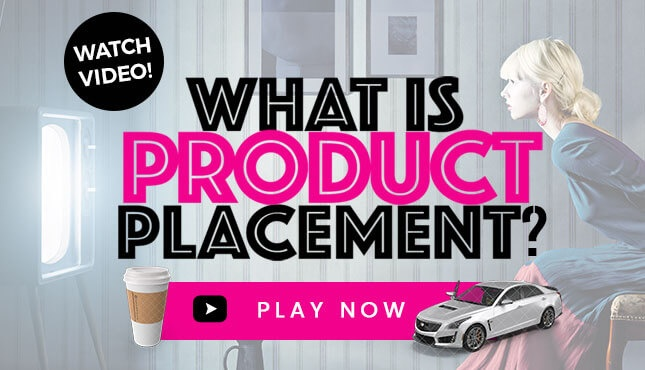 To learn more about different kinds of product placement, you can download our e-book for free!